Christine Harries is a young engineer who believes strongly in the value of networking and mentoring. Her ability to motivate, communicate, and collaborate with people from different fields, to contribute original ideas and to see the big picture permeates both her day-to-day work and the many professional volunteer activities in which she is involved. Harries studied building engineering in Concordia University’s co-op program, graduating in May 2013 with Great Distinction. 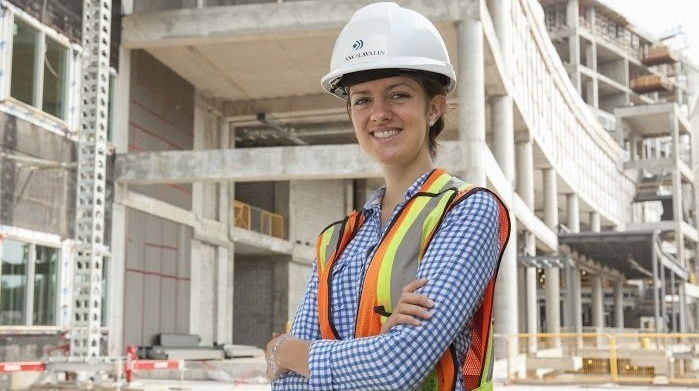 During her final internship, the Quebec engineering firm SNC-Lavalin offered her a scholarship, and later, a full-time job. Now an engineer in building structures at SNC-Lavalin, Harries works closely with water process engineers to provide optimal building structure designs for both wastewater treatment and drinking water production for the Greater Montreal area. She is currently working on the structural steel and concrete design for a major new water treatment plant. Project manager Michelyne Tremblay says the industrial nature of the project demands close co-operation by people from many different fields. “We constantly receive new requests, have to change things, consider new options. Christine contributes and works very closely with all the different disciplines to make it happen.” Moreover, many of her recommendations and innovative proposals have led to time, financial and energy savings. Harries credits her achievements to the trust and respect shown by her supervisor and co-workers. “My boss really gives me an independence and freedom to show what I’m able to do and to be a leader in the structural team,” she said. Her contributions extend far beyond her job. In 2012, Harries joined the young professional network (“Forum”) of the Quebec association of engineering consulting companies (AFG), and became a member of the board of directors in 2014. She sits on its building and conferences committee, helping to plan professional development events that bring together not just young engineers, but also young lawyers, urban planners and architects. Last year, Harries represented Quebec on the Young Professional Network of ACEC-Canada (Association of Consulting Engineering Companies). At their 2015 Leadership Summit, she spoke about the importance of networking, mentoring and co-op programs. Whether it’s speaking at career fairs, working in her church’s community kitchen, participating in the Great Canadian Shoreline Cleanup, or being a judge for the Great Canadian Northern Concrete Toboggan Competition, Harries finds huge benefits in volunteering. “You meet so many different people with whom you otherwise wouldn’t cross paths.” Through her involvement, she has also gotten to know people within her company who are outside her team, providing her with a network of experts and resources to draw on in her daily work. Next to buildings, her biggest passion is playing and composing music, especially piano. She loves nature and the outdoors, and is a former lifeguard and ski instructor.